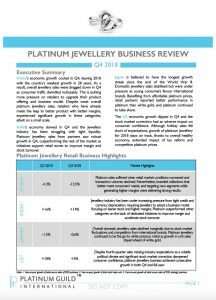 The Platinum Jewellery Business Review (PJBR) is an annual report by PGI, analysing retail sales of platinum jewellery, trade performance and consumer sentiment in PGI’s four key international platinum jewellery markets of China, India, Japan and USA. The PJBR is updated quarterly throughout the year. Research for this report is conducted via surveys among a large sample of platinum retail jewellers and manufacturers in each market. Available for subscription. Please contact us for more information. Access and subscribe with the Platinum Guild International’s publications using your email address.